Welcome to Mrs. Clare's books! 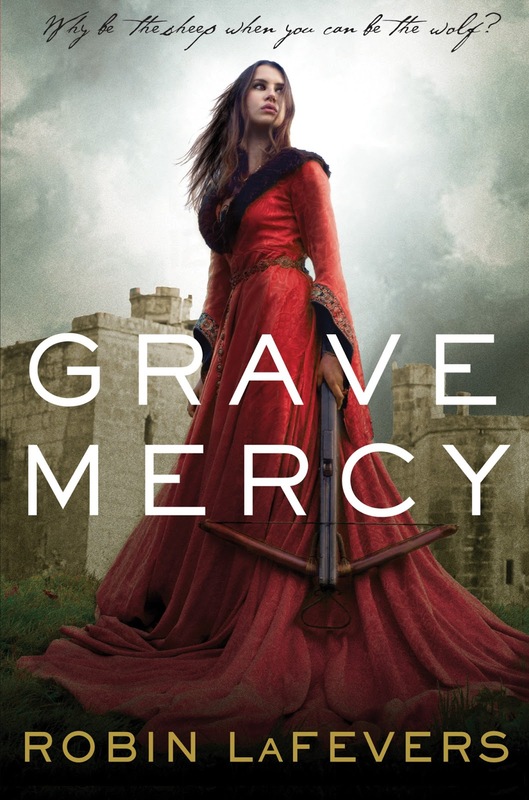 This first book I am going to review is Grave Mercy by Robin LaFevers, first in the "His Fair Assassin" series. 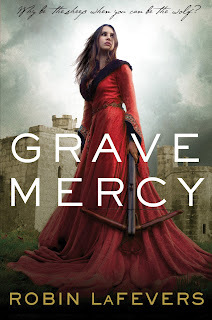 Grave Mercy is a Young Adult Fantasy Romance complete with historical characters and assassin nuns. Intrigued? I was too. Ismae is a 17 year old whose father is trying to forve her into an arranged marriage with a horrible man. She escapes and is brought to a convent where the nuns and other girls serve St. Mortain, the saint of death. They are trained in combat, seduction, potion-making and other skills in order to carry out their assassination orders on whomever death deems their time has come. On Ismae's first mission, she is sent to Brittany, into the family of Anne of Brittany. Anne was a real figure in 15th century Brittany who became Duchess at age 11. In this book, she also has a sister Isabeau (another real figure) and two half brothers. One of the half brother, Duval, is Ismae's handler, and eventual romantic interest. Grave Mercy details Ismae's struggles with following her heart, versus following the mission given to her supposedly by St. Mortain. She and Duval have a very subtle, yet sizzling romantic interest throughout the book, and eventually Ismae's heart wins out. I really enjoyed the underlying true story line with the story of 15th century Brittany. Historical fiction fascinates me, especially when little bits of fictional events or characters are thrown into it. The romance was also heartwarming and satisfying. Duval is a prickly character, with a very gruff personality, but in that lovable way where you just know that the right woman can get under his skin. Ismae is the perfect woman for him and they have a palpable chemistry on the pages. This book was 4 out of 5 stars for me and I can't wait for the next one. Dark Triumph, book 2 in the series is set to come out April 2nd. If you haven't checked out Grave Mercy yet, you better hurry, because I guarantee you'll want to read the next one as soon as it comes out. Check out Robin on her website at www.robinlafevers.com to see other books written by this talented story-weaver. And don't forget to pre-order your copy of Dark Triumph. You won't want to miss it!